John “Falcon” Chapman (MJW) is a suicidally depressed ex-Marine with PTSD whose emotional problems are exacerbated by alcohol abuse. That may seem dark, but things start to look up for Falcon when a new mission gives him renewed purpose in his life. Unfortunately, though, the mission involves his sister Cindy (Ali), who was attacked and hospitalized while in the favelas of Brazil. Falcon arrives in Sao Paulo and proceeds to beat up a bunch of people in his quest for answers. 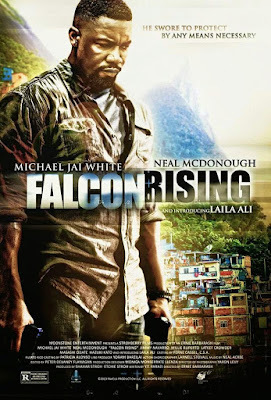 Teaming up with old contact Manny Ridley (McDonough), as well as gaining some new friends and foes along the way, Falcon discovers some surprising revelations about the crime syndicates of Brazil - the Japanese Yakuza is all over the place. Will Falcon find out who his sister’s attackers were without getting himself killed in the process? We love Michael Jai White, or MJW as we call him, and we’re happy to report he’s still “got it”. His Martial Arts abilities are cool, brutal, and top-notch. 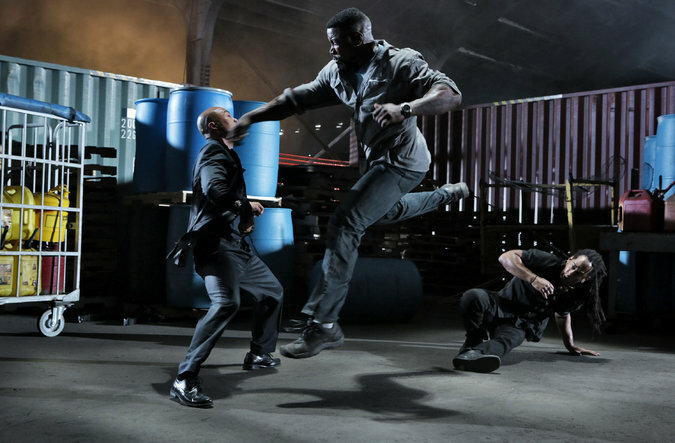 By far the best thing about Falcon Rising are the fight scenes, all of which involve White. Unfortunately, the movie AROUND it isn’t so hot. The plot is paint-by-numbers and you don’t get hooked in to the storyline like you could or should. We know a lot of people criticize action movies, saying that they’re dumb and the plots are perfunctory window dressing so that the action setpieces can exist. In the case of Falcon Rising, that’s a valid observation. We don’t like CGI bullet hits. We don’t like CGI blood. We don’t like CGI anything. “Speeding up” the action to cover it up doesn’t work, and turning the blood into a “mist” is not a valid masking device either. Is doing this less expensive than squibs? Is it somehow an improvement in the development of mankind that nerds on a computer can now hit Alt-B for blood and Alt-E for explosion? This is considered acceptable and good? Especially when you have a charismatic and talented Martial Artist like MJW at the helm, CGI stuff should be eschewed. 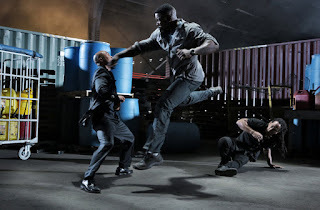 Michael Jai White fans - and action fans in general - will appreciate the action scenes, which are quite good. The movie around it, not so much. Welcome back from Internet oblivion, rising from the ashes like the proverbial falcon, or was that phoenix? You have been sorely missed. I understand your reasoning behind giving it only two stars, but as long as the action is good, I'm usually satisfied. This movie is miles above MJW's follow-up Chain Of Command, anyway. Thanks! We're glad you found us again. Happy to hear this is better than that one. We'll try to watch Chain Of Command soon. Have you seen the Muldoon or the Dudikoff Chain Of Command films? The Muldoon was mediocre, and I honestly don't remember anything about it. The Dudikoff is a solid movie. I just recently managed to find a widescreen DVD of it from France. I don't think it has been released in widescreen anywhere else. Agreed the Dudikoff one was a solid action flick. Will avoid the Muldoon one for now unless we can find it dirt cheap.